Pan Galactic Digital is Drum Search Awards US finalist for Best PPC Campaign. 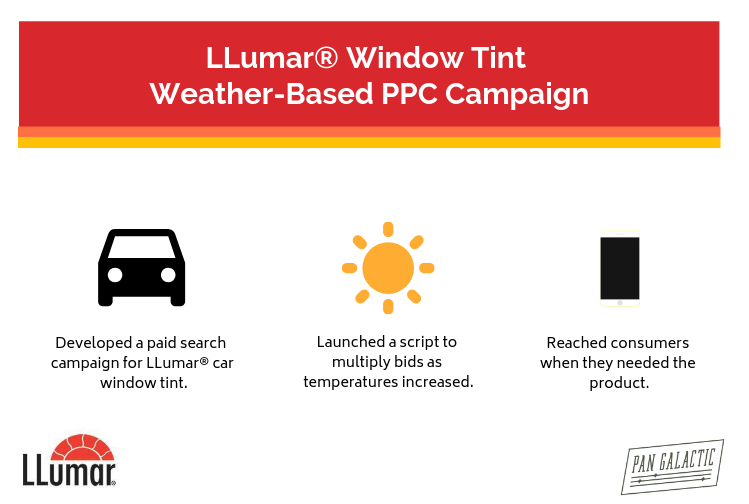 The agency is being recognized for its weather-based paid search campaign with LLumar Window Film, an automotive tint product that is applied to windows to block UV rays, enhance vehicle appearance, and prevent heat glares. Through extensive keyword research, Pan Galactic found that searches for “car window tint” and similar keywords increased during warm months. With that data in mind, the agency developed a Google paid search script that automatically adjusted bids based on temperature. 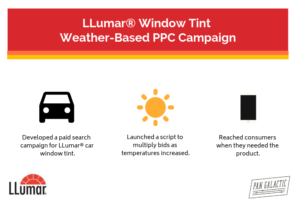 This gave LLumar the ability to reach consumers when they were most likely to search for window tint: When they’re sitting in a hot car and using their phone to Google the nearest window tint dealer. LLumar’s weather-based paid search campaign is an example of one of the many ways Pan Galactic uses data insights to develop creative campaigns for clients.